Everyone has different opinions on Bitcoin. Some think it’s the wave of the future, some think it’s a fad — or worse, a worthless type of “tulip mania!” As I learned with my recent article about the scaling debate, the crypto-community is often filled with lively debate and strongly-held beliefs. One thing that everyone can agree on, however, is one basic fact: Bitcoin is volatile. In the past few years, its price has vacillated between $600 and $20,000 per coin — now that’s quite a gap! One should expect a certain amount of volatility when going into this, but many people are understandably worried when they see the value of their coins. What is one to do when the value of Bitcoin seems to be going down over a long period of time? If you’ve been in the cryptocurrency world for long, you’ve probably heard HODL. 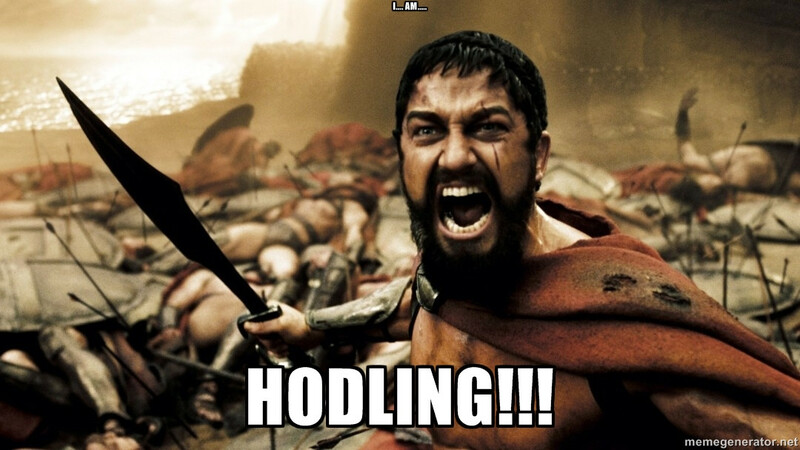 Some mainstream news sources have said that HODL stands for “Hold On For Dear Life” — of course, this is totally false. Instead, the acronym comes from a satirical post from bitcointalk.org in which someone discusses the highs and lows of trading bitcoins. Meme courtesy of Investopedia. Please don’t hate me. While it’s not an acronym for “Hold On For Dear Life,” that’s a pretty accurate description of what people mean when they say it. HODLing is all about simply sitting on your bitcoins until the price comes back up. In general, I am a long term HODLer when it comes to coins I take great interest in — unless my opinion changes on the overall future potential of a coin or token, you’re probably not going to see me panic selling. Indeed, you might see me buying more! However, many people don’t have the taste or the stomach for this. They see themselves losing money, and — understandably — they don’t like it. Other than getting out of crypto entirely, what do people do? You’ve probably heard the phrase “tethering up,” but what is tether? Tether (USDT) is a so-called “stablecoin” which is based on one simple premise: one tether will always equal one US dollar. There has been quite a lot of controversy about this coin which is closely tied to the Bitfinex exchange which effectively owns the Tether corporation which issues these coins. Some have suggested that Tether has been used to heavily manipulate the price of Bitcoin. Others have gone further and suggested that the Tether corporation is insolvent. The basic idea behind USDT is that new coins are only “minted” when someone directly purchases them from the Tether corporation at the price of $1 per USDT. The USDT is then supposedly “backed” by the US dollars in the Tether corporation’s bank account; this means that you could redeem 100% of the issued USDT for fiat money if you wanted to. If the Tether corporation was insolvent, however, that would mean that USDT’s exceedingly stable price of $1/USDT is based on smoke and mirrors. They’ve had some issues with auditors in the past, and many questions about their business practices still linger. With that said, Tether has indeed managed to stay exceedingly stable so far. I could write an entire article just about Tether and the various positive and negative opinions about Tether — for now it should suffice to say that it is controversial! Bottom line: why should you buy Tether? So far, Tether has remained very fungible. You can trade Tether in many places, including my preferred exchange Binance. If you’re willing to put some faith in Bitfinex and the Tether corporation, trading your existing Bitcoins or other crypto for Tether could be a smart short-term move. Tethering up is the idea is that you can preserve the value of your assets in Tether while the price of Bitcoin goes down, and then you buy back into Bitcoin as soon as you think that a bull run is starting. As I’ve mentioned, this is not the way I like to trade — I’m mostly interested in ultra-long-term trends. With that said, I understand many people don’t think like me. Allow me to offer up an alternative to tethering up: Binancing up! Both coins exhibit the same December-January spike and subsequent downtrend. However, BTC’s downtrend continues while BNB’s value actually rises higher — in terms of BTC, anyway — than it was back at the height of Bitcoin mania. How could this be possible? I talk a lot about application coins, or “appcoins,” in my writing. Most if not all of them are ERC-20 tokens which are meant to support some sort of platform or application in one way or another. BNB is arguably the greatest example of any appcoin out there. It has a real, tangible use on the Binance exchange — it can be used to pay transaction fees and you get a discount for using it instead of other coins. Recently a new feature was added which allows you to collect “dust” — small amounts of other coins you may have in your account — and automatically trade them all for BNB. If you take cool features like these and combine them with a platform that’s actually heavily used, you’ve got a really exciting recipe for success. Binance is one of the biggest exchanges out there, and it’s got the best track record. It’s no secret that Binance is my favorite place to trade cryptocurrencies. They’ve given me zero cause to doubt their professionalism and security practices. I believe that the exchange isn’t going away anytime soon, and as a result BNB will likely rise in value — or at least retain its existing value — as time goes on. Consider this: people don’t stop trading during bear markets. Perhaps they’re trading coins back and forth in order to try to find something that can thrive in a bear market. Perhaps they’re just tethering up! Either way, they are probably using BNB to do it if they’re performing these trades on the Binance exchange. The unfortunate reality is that many coins are pretty much entirely built on hype, smoke, and mirrors. With BNB, we instead have a token that’s used every single day by millions of people — a token that people are heavily incentivized to buy! Now, I’m not making any promises. As with everything related to crypto prices, unexpected events can happen. Prices can rise, and prices can fall. However, for me, I will never hold Tether when such a more attractive option is available. Bottom line? If I’m not HODLing, I’d much rather binance up than tether up. Trade them for altcoins on Binance, KuCoin, HitBTC, or Changelly. If you’re trying to get BNB, Binance is obviously the place to be!